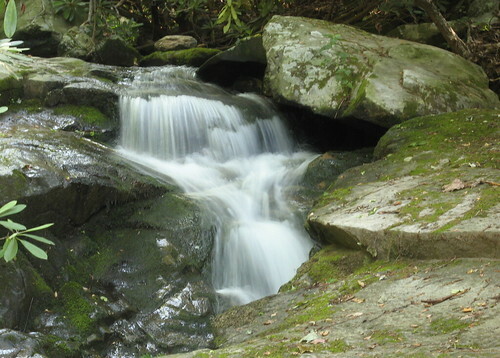 This is a surprisingly vigorous 3.2-mile hike from the city park of Blowing Rock, North Carolina, to the base of Glen Burney Falls. The town itself is mainly a tourist destination named for the legendary Blowing Rock, a crag where an Indian Brave of local lore flung himself down the mountain, only to be rescued by a strong updraft. The updrafts are real, as is the $6 admission fee, and there isn’t much hiking to be had. 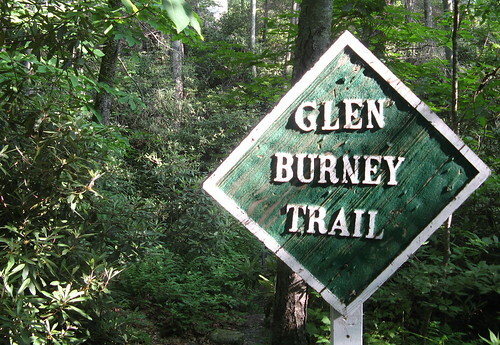 Glen Burney Trail, however, is a fine getaway from the rows of restaurants, condos and antiques galleries crammed into the little mountain town, which is just a couple miles south of the Blue Ridge Parkway. 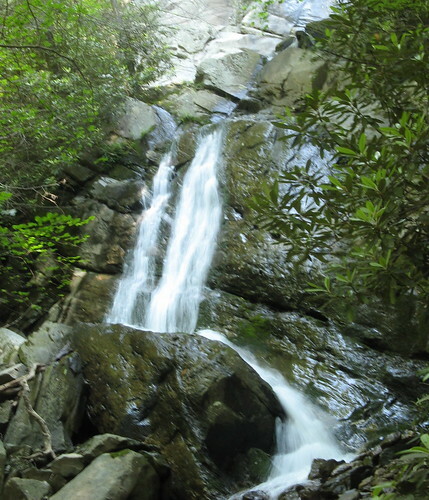 The main attraction is a series of cascades and waterfalls tumbling to the base of Glen Burney Falls, which is a must-see destination for this section of the Blue Ridge Mountains. It’s not thundering huge like the falls in Transylvania or Brevard counties, but it’s impressive when you consider it’s less than two miles from Tourist Central. 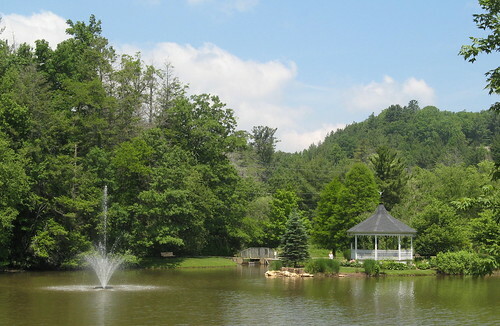 Best place to start from is Memorial Park along Main Street in Blowing Rock. 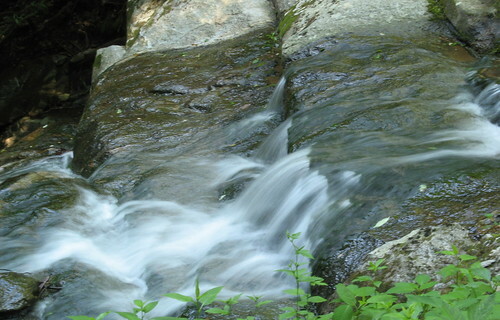 The trail is just across Laurel Lane in the Annie Cannon Memorial Gardens; nearby Mayview Lake drains into New Year’s Creek, which feeds the waterfalls. Theoretically the best time to come would be early to mid-May when the rhododendrons are blooming. Frankly, though, I’d seek a more remote locale for wildflower gazing; I’m guessing Glen Burney Trail gets pretty mobbed during bloom season. The rhodos were all gone yesterday; a few hearty mountain laurels were hanging in there. I did see one stand of these; can anybody identify them? 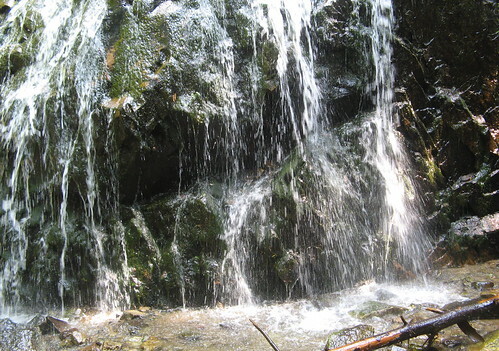 Mainly, though, this is a waterfall hike; it’d look fantastic in winter after a snowfall with the abundance of ice, though you’d have to be very careful about the footing, which gets steep, rocky and root-tangled in several places. Also bear in mind that it’s all downhill to start and all uphill on the return — my GPS logged over 1,000 feet of total elevation gain, which is a pretty good climb in just over a mile an a half. And while it’s shady enough for a pleasant morning hike in the summer, you’d best get your hiking done before lunchtime. Blowing Rock is a bit cooler than the flatlands in summer, but it still gets pretty steamy late in the afternoon. Generally the hike is shady enough to play around with blur effects on your digital camera. Even if you’re not into photography, the sound of the creek running is audible most of the way. 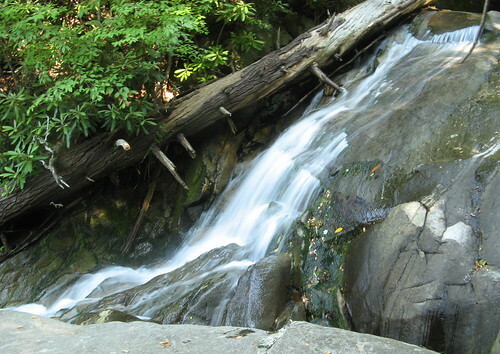 If you stay on the trail till it ends — a sign alerts you to where it becomes private property — you can turn back and explore a few side trails that end at the base of Glen Burney Falls. This is about half of it. Another pretty cascade on the return trip. Photo didn’t come out so great, but it’s one of the nicest spots along the hike. Overall, an excellent hike despite the short distance and proximity to tourist locales. A hiker that really blogs – or it is the other way round! Newbie question – 3.2 miles one way or out and back? Looks like a great trip. I think the flower is a foxglove. Mary: it’s 3.2 out and back (1.6 one way). Hiking between the rock, always being my favorite as I like mountain riding. I would love to visit this beautiful trial. Love the pics and adventures that I am gonna do on my trip. We’re headed there in a few days for some hiking, mainly on the Tanawha Trail, but hope to fit in the Glen Burney trail as well. Thanks for the I.D. on the flower. 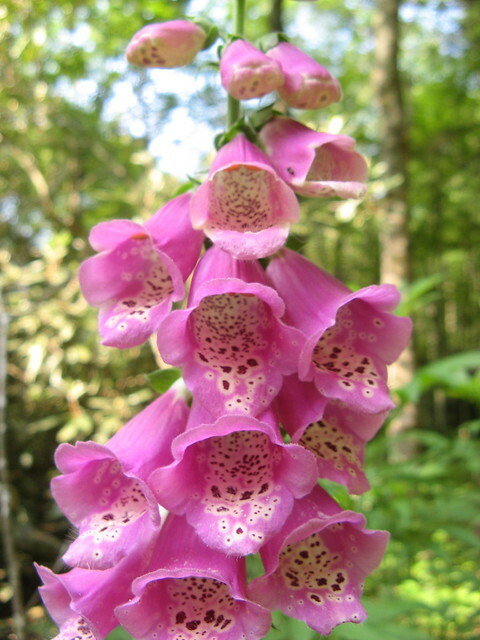 It might be awful hot there, though maybe first thing in the morning it’ll be OK.
I’m pretty sure the pink bell-shaped flowers are foxglove (or digitalis).